Oscar De La Hoya of Golden Boy Promotions has flagged his interested in matching his marquee fighter Saul “Canelo” Alvarez 49-1-2 (34) with undefeated IBF welterweight champion Errol “The Truth” Spence Jr 24-0 (21). The 28-year-old southpaw would be expected to move up a full two weight classes to middleweight if he wants to pursue the fight with the popular Mexican. Spence recently found himself in the media when WBC and IBF lightweight champion Mikey Garcia, who has fought as high as 140-pounds, announced his desire to more up to welterweight to fight him. Before the fight can happen Alvarez will need to recover from his fight against Kazakh wrecking machine Gennady “GGG” Golovkin 38-0-1 (34) at the T-Mobile Arena in Las Vegas, Nevada on September 15. 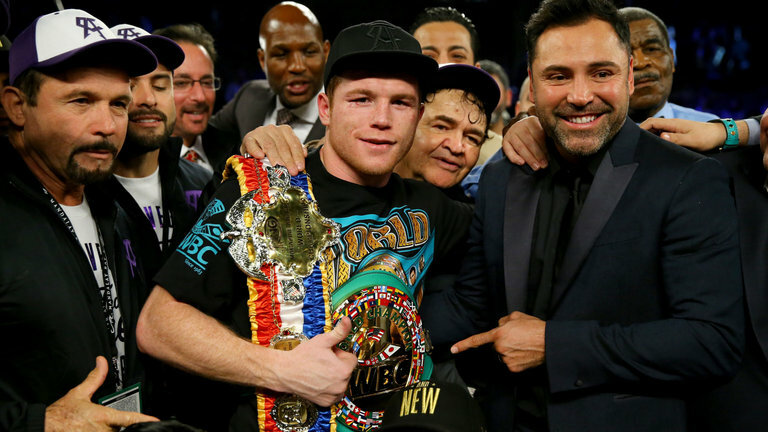 Alvarez held the 36-year-old unified middleweight champion to a controversial draw when the pair met at the same venue almost a year ago, prompting calls for a rematch that was due to take place in May. The 28-year-old Mexican was forced to withdraw when he was banned from boxing for six months by the Nevada State Athletic Commission after he failed two drug tests conducted in February. The Alvarez team blamed contaminated beef for his high readings of the banned substance clenbuterol. “We would really make that a super event with Canelo and Spence,” De La Hoya said. ”Obviously first thing is first. Spence has his plans and Canelo has our plans, so we’ll see what happens in the future. Is Jessie Vargas a dark horse opponent for Terence Crawford?